Parquetry is available in two basic types-Mosaic and block parquetry. Mosaic Parquetry consists of small fingers of timber 8mm thick set on a backing sheet normally laid in square on square pattern. Block Parquetry is hand laid one piece at a time. The standard size is 260x65x19mm in thickness. There are also imported timber such as European Oak and American White Oak. When laying the block parquetry you are not limited in design and there are many PATTERNS available in the Block parquetry. Block parquetry provides not only numerous patterns but it can be highlighted by having Feature Borders which give a finishing touch of elegance. Borders are often a combination of contrasting timbers which further enhance its beauty. Parquetry can be laid over all types of sub-floors including concrete, timber, particle board and Plywood. Today’s modern adhesives provide that extra insurance that your floor is there for the long term. 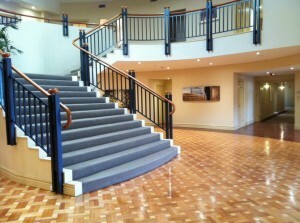 Please have a look at our Block and Mosaic Parquetry Galleries. A big thanks to Ink Signs at Kirrawee for the wrap of our new van! Great job guys.